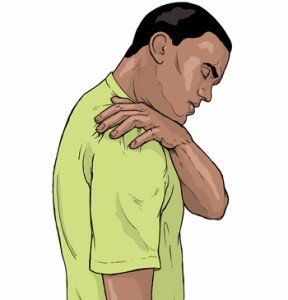 Have you ever experienced frequent muscle cramps or spasms? 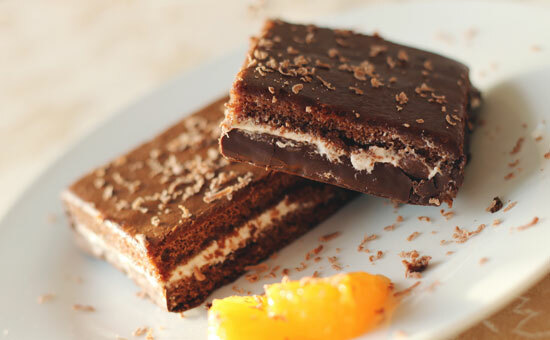 Or how about intense chocolate cravings that make it impossible to think about anything else? Maybe you even often struggle in the bathroom…well you know…pooping? If you experience one or more of these issues, it could be that you are deficient in a mineral called magnesium (1). Magnesium deficiencies are known as the “invisible deficiency” by experts because it’s so commonly overlooked. But that obviously doesn’t mean magnesium should be ignored. In fact, it should be taken quite seriously. Magnesium deficiencies are possibly one of the most common deficiencies that is unknowingly causing suffering. But how can one mineral cause so many issues? Magnesium is essential for more than 300 different enzymatic processes in the body. It has a role in countless body functions such as your heartbeat, muscle movement, or the production of hormones. As you can imagine, since magnesium is involved in so many processes in the body, it can cause problems when you don’t get enough in your diet. And deficiencies do cause problems for the estimated half of Americans that do not consume enough magnesium (2). Unfortunately, most of these people are completely unaware that they have a magnesium deficiency. These people experience the side effects, but may accept it as part of their normal life. The sad part is, magnesium deficiencies are easily fixed. Since a magnesium deficiency is so easily fixed but at the same time overlooked, I am going to show you the most common signs and symptoms. Hopefully this will help people avoid needless suffering. Although the exact cause of muscle cramps and spasms isn’t yet known, many think a lack of minerals is to blame. Specifically, being low in potassium, calcium, or magnesium is thought to cause cramps (3). Magnesium is important for muscle relaxation. So when you lack magnesium, your muscles can involuntarily contract which can cause painful spasms. This issue is even more common than you may think thanks to our coffee-addicted society. Diuretics (substances that make us pee more) such as coffee, tea, or even blood pressure medications can quickly deplete our mineral stores. When we urinate, minerals leave our body. If you frequently drink coffee or take a diuretic medication, you may want to consider a multi-mineral supplement or take extra care to get more minerals in your diet (especially if you discover you experience many of the symptoms listed here). When we crave foods, it is our body’s way of telling us that we need a nutrient. And no this doesn’t excuse eating cake every night because you’re “craving” it. You have to listen to your body and learn to interpret exactly what it is telling you. For example, let’s say you’re jonesing for a chocolate cake with chocolate frosting. In reality, your body may not be craving cake at all. Instead it is craving the chocolate. But why would your body crave chocolate? Well, dark chocolate is actually a great source of magnesium. It contains about 24% of your daily requirements in just one square of dark chocolate! So if your body is craving chocolate, it may be that you are deficient in magnesium. If you want to take advantage the many benefits of chocolate and get an adequate amount of magnesium, you had best be sure you are eating a high quality dark chocolate. That way you can still satisfy your chocolate cravings, but do so without feeling guilty or making it unhealthy. Do yourself a favor and skip the sugary crap (milk chocolate). Most milk chocolates are unhealthy for you and contain small amounts of cocoa so the health benefits are almost nonexistent. Consider eating a dark chocolate that is 65-70% cocoa (or more). The darker the chocolate, the more magnesium and health benefits there are. By far, my favorite brand of chocolate is Endangered Species Chocolate. It contains no harmful substances, minimal levels of sugar, and is GMO free. At first, it may be difficult to get used to darker chocolates, but trust me your taste will slowly adapt. After eating dark chocolate for a while, you will find that milk chocolate is so sweet that it is inedible. That is what happened to me and others I know who have switched to dark chocolate. As an ex-milk chocolate eater, I now can’t even get myself to appreciate milk chocolate because it tastes way too sweet. Do not be deceived by some dark chocolates…some say they are dark but are usually much less than 60% cocoa. Do you feel anxious on a normal basis? Do you get worked-up over the uncertain future? If so, you’re certainly not alone. Anxiety is one of the most common mental illnesses in America (4). So if you often feel worried, nervous, or uneasy about an uncertain outcome, you may want to consider getting more magnesium through your food or in a supplement. While magnesium may not be the cure for anxiety caused by other factors, you will want to seriously consider it if you experience anxiety in addition to any of these other symptoms that are listed here. If you have trouble sleeping, staying asleep, or are an insomniac, you may be deficient in magnesium. In fact, even a small lack of magnesium can prevent the brain from relaxing at night. This is because magnesium plays a key role in your central nervous system. 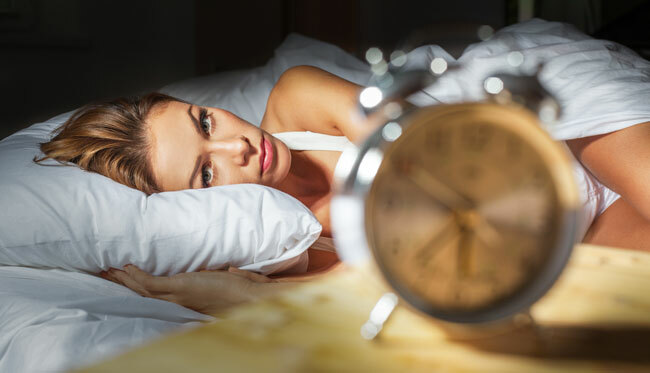 Since magnesium is also known to promote relaxation, it is recommended that if you take a magnesium supplement, you should take it at night to take advantage of this trait. Many people (including myself) take magnesium at night to take advantage of its relaxing effect. Ideally, by restoring your magnesium levels back to normal (this can take some time depending on how deficient you are) and taking a supplement at night, you can get a satisfying restful night’s sleep. Noticing the relationship between relaxation and magnesium yet? The relaxing effect of magnesium applies for your digestive tract too. When your body is low on magnesium, your intestines tend to contract more. As a result, it’s harder for waste to pass which in turn can lead to constipation. But magnesium isn’t only important for the relaxation of the intestines, it also pulls water into you’re your intestines which allows waste to move along easier. Think about it. What if you had to go down a water slide with no water? Either you would get a killer friction burn or you would get nowhere. The same goes for your digestive tract. Magnesium helps dilate and relax your blood vessels. Since magnesium helps relax our blood vessels, it does the opposite when we are deficient in magnesium. In other words, a magnesium deficiency can cause high blood pressure by increasing blood vessel constriction. No amount of healthy eating (unless it there is magnesium in the diet) or exercise is going to significantly lower your blood pressure if you are deficient in magnesium. So if you experience difficulties with high blood pressure, you may want to consider getting enough magnesium in your diet. When you get a headache or migraine what do you typically do? Take Ibuprofen, Alieve, or some other NDSAID (non-steroidal anti-inflammatory)? Lay down and relax? 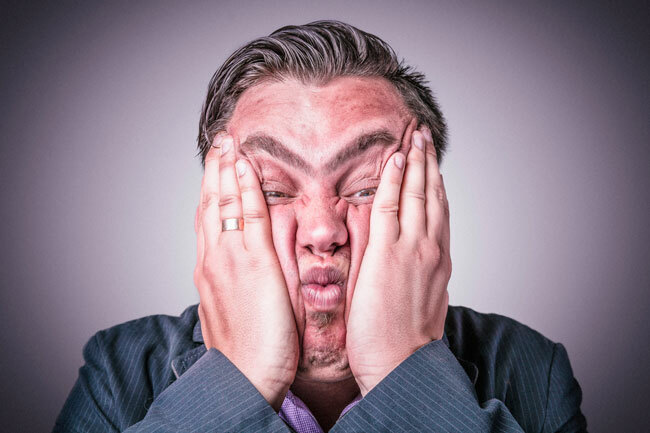 Most headaches or migraines are the result of a constriction or tenseness one way another. Tension headaches, for example, are the result of tense muscles in the upper back, shoulders, or neck–these are often perceived as migraines. Studies have shown that people who experience migraines often have lower levels of magnesium compared those who do not experience migraines. So instead of running to the medicine cabinet to get some Ibuprofen, consider the possibility of a magnesium deficiency. Restoring your magnesium levels and adding an adequate source of magnesium in your diet may result in long term relief from migraines or headaches. Using magnesium for long-term relief would be a much better option than temporarily relieving the pain with drugs don’t you think? As you know by now, magnesium is an essential mineral for muscle relaxation. Since your heart is also a muscle, when you lack magnesium, your heart struggles to maintain a normal rhythm of contraction and relaxation. This can cause irregular heartbeats or what healthcare professionals call arrhythmia. Do you constantly suffer from heartburn or acid reflux? If you take a medication to control your acid reflux and still get no results, you may be deficient in magnesium. Magnesium helps the sphincters at the bottom and top of the stomach relax, which allows food to go where it is supposed to go. But when we lack magnesium in our body, the sphincters or valves at the top and bottom of our stomach cannot properly contain the food. As a result, food & acid can tend to get pushed back up into your esophagus. When the acid hits your esophagus, it causes a painful burning sensation which is the acid reflux or heartburn you feel. Pills that block acid such as Pepcid, Zantac, or over-the-counter Prilosec can make your heartburn worse. These pills, called proton-pump inhibitors, block the production of acid in your stomach–which in theory is good for acid reflux. But we need acid in our stomach to properly absorb magnesium (and vitamin B12). 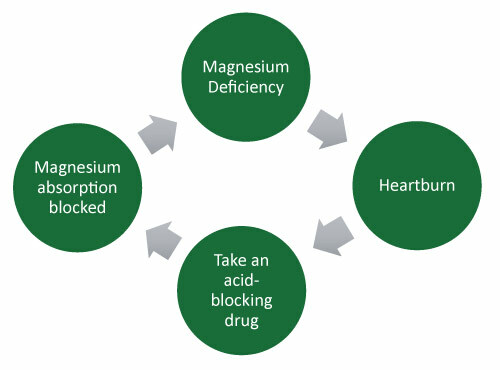 As a result, acid-blocking drugs can cause us to become deficient in magnesium. 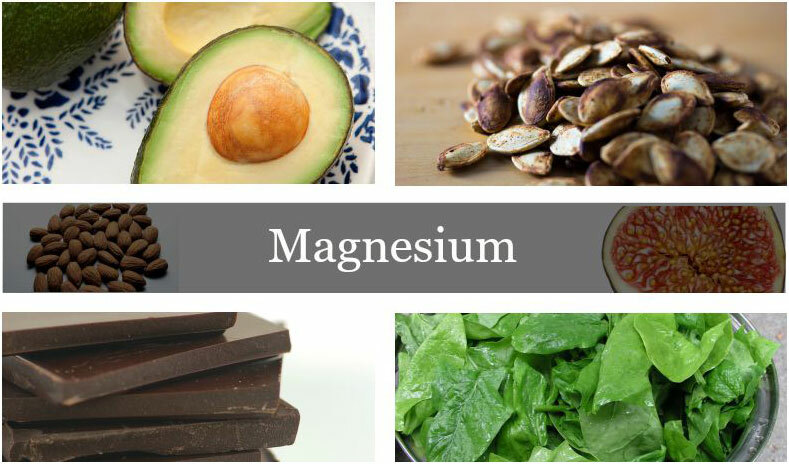 So You Think You’re Deficient in Magnesium. Now What? The most obvious answer is that you need to replenish your body’s magnesium levels. But it isn’t that easy. The hard part of getting your magnesium levels back to normal is knowing how to properly & safely do it. If you only experience one of the listed symptoms of a magnesium deficiency, it may be that your issues are caused by something else. Not all heart burn, for example, is caused by a magnesium deficiency. Although, most people are deficient in magnesium anyways, so it couldn’t hurt to consciously get more magnesium in your diet. The more symptoms you experience that are listed here, the greater the chance is that you have a magnesium deficiency. There are two ways you can get magnesium into your body too alleviate the symptoms of a magnesium deficiency: through your diet and with supplementation. vegetables, nuts & seeds, and whole grains contain magnesium. Check out this infograph from Dr. Axe to see what foods contain the highest levels of magnesium. For some people, simply eating foods with magnesium will be enough to make you feel better. In cases of a more extreme magnesium deficiency, a supplement may be a better option. If you plan on or are taking a magnesium supplement, make sure you do not go overboard on the magnesium. Check out your magnesium RDA (daily recommendation) and if your supplement comes close to your RDA, then you do not need to add magnesium-containing foods to your diet. If your supplement does not meet your RDA, feel free to conservatively add them to your diet. If you’re going to spend money on a supplement, it would be best to pick a supplement that will give you the best results right? When looking for magnesium supplements, you should either take magnesium glycinate or magnesium citrate. Not all magnesium supplements are the same! Magnesium glycinate and magnesium citrate are absorbed in the body much better compared to other forms of magnesium. Magnesium glycinate is considered to be the best (but magnesium citrate is not far off). The RDA for magnesium (daily minimum needed) is around 310 mg a day for females and 400 mg a day for males. So when you look a supplement, consider these numbers. When looking on Amazon, you can usually look at a picture, like the one shown below, of the nutritional facts. Make sure the supplement of your choice meets your RDA. One of my “mantras” in life is to always exercise moderation. With that said, don’t go overboard with magnesium. Don’t take more than the recommendation on the bottle or your RDA. If you take too much magnesium, you will likely get diarrhea. This magnesium citrate supplement is nice because it provides only 200mg of magnesium as opposed to the general 300mg recommendation. When a supplement contains too much magnesium, it becomes easy to get too much magnesium in your body because most of us get varying amounts of magnesium through our diet. It’s a nice and safe starting point for a magnesium supplement. And it is magnesium citrate, so your body will absorb it much better compared to other supplements. Another magnesium supplement that your body can absorb quite well. This supplement is a little more aggressive compared to the previous supplement. Instead of 200mg, this supplement provides 400mg of magnesium. This may be a better option for those who have a more severe magnesium deficiency. You can also consider a multi-mineral supplement. Magnesium is not the only essential mineral that our body needs. Just like many of us take a multi-vitamin to make up for vitamins we may be missing out on through our diet, multi-mineral supplements can do the same. When considering a magnesium supplement, it is always important to consult your physician first. There are several pharmaceutical drugs that magnesium negatively interacts with. If you are considering a magnesium supplement, it would be wise to check this list to see if any of your medications are listed here. To see the full list of interactions, click here. Most people get far less magnesium than what their body needs. The longer you go on with a magnesium deficiency, the more symptoms you will likely experience. If you or someone you know may have a magnesium deficiency, do them a favor and tell them about it (or send this article to them). Considering magnesium deficiencies are so easily cured, there is no reason why anyone should have to suffer through their life with its symptoms. Also, please remember that replenishing the magnesium stores in your body takes time. So if you add magnesium to your diet or take a magnesium supplement, do not expect results instantly. The time it takes to completely restore your magnesium levels depends on how deficient in magnesium you are. In other words, don’t just eat a few foods with magnesium and immediately give up. It takes time to see results and get relief. I would give it around two weeks before you should expect to see results. You may see results much quicker than 2 weeks—everyone is different. What are your experiences with a magnesium deficiency? Have you cured yourself of a magnesium deficiency? If so, share your story—we would love to hear it! Taking magnesium citrate has changed my life. I was beginning to worry about my health. Doctors were telling me I just needed more fiber and water. And I was doing that! I was craving chocolate, muscle cramps, etc. I should have known I was magnesium deficient. I personally prefer glycinate because citrate is *sometimes* produced from GMO-based products. That being said, I’m happy to hear you figured it out! Not many people do. And unfortunately too many physicians are not adequately trained in nutrition because they are so heavily reliant on prescription drugs to cure everything. I also switched to magnesium glycinate I read it is the easiest on your stomach and it is 80% absorbed. tightness back spasms and leg cramps until I started takin magnesium. I was diagnosed with a magnesium deficiency 20 years ago when I experienced severe anxiety. I started with slow -Mag . I cant go without it. When stressed I soon have heart arthythmias and then take more slow – Mag. Unfortunetly the doctors don’t consider magnesium deficiency seriously. I like to know what is the matter and life is much easier if considering Magnesium as the culpret. I am concerned that I do not take the right dose of Magnesium. I drink 2 slow mag tablets daily. When stressed I get anxious. Can I combine the Slow Mag with Magnesium Oil?. I also bath in Epsom Salts when I get too anxious. Did you happen to read the bottom of this post? It would depend if your using a magnesium supplement that has a high bioavailability. I know I am deficient in magnesium, I have been for a long time now. I supplement but probably not a good one. I have most of the symptoms listed. I have a hiatal hernia and suffer with acid reflux and take a Nexium every day, do you think the right kind of magnesium could make a difference? I REALLY need to get off the Nexium!!! Any advise? Have have been relying on magnesium supplements for 20 years. In my 20s, it eliminated with muscle cramps and PMS mood swings. In my 30s, it helped with anxiety and now I am using it and probiotics for sudden onset of heartburn which I NEVER get. Also, I love coffee, but have never been able to drink more than a cup a day…and I will go through spells where I drink a cup every morning. After about a month, I will start to get sort of short of breath. I read somewhere that caffeine can leach magnesium out of your system…so…I started taking it to see if it would solve the shortness of breath. Which after about 3 days of upping magnesium and stopping coffee…it does. I don’t know exactly why I require magnesium so frequently…but I do go through spells where I eat too much sugar and then start to crave crappy food and eat less veg. I think it is fascinating…all of it. I’m not sure if this has anything to do with it but when you eat too much sugar, it can also cause you to lose magnesium. This is because consuming sugar significantly increases your thirst which can increase your urine output. So just like coffee, it can cause you to excrete extra magnesium that your body would normally use. It’s really hard to say for sure because anxiety can be caused by so many things. It’s possible that could be the cause, but again, there could be other things at work. For me, daily mindfulness meditation made all the difference with anxiety–ignore the stereotypes about meditation as it prevents people from trying it. I have all the symptoms ! Is it really magnesium deficiency that disturbing the quality of my life ? I have very bad headache; muscle crump; acid reflux; irregular HEART beat; burning sensation ; stiftness in my back upp er part of my neck ….oh this night is may be going to bring PEACE in my life ! Thanks all för share the very important experience ! After doing research on magnesium Ive found that the supplements can give you diarrhea. I have been using a magnesium lotion with good results and no nasty side effects. Yeah, that tends to happen to some people who are extra sensitive to it or are taking large doses of magnesium. The only problem is magnesium lotion is that it doesn’t go systemic as easily which means it doesn’t supply your whole body with Mg. But if you’re one of those people who are sensitive to it, then that’s certainly the better way to go! I went to the gp – was in for 5 minutes – came out with reflux medication. Desperate I took one tablet then looked up Patrick Holford Reflux – Jeepers Creepers – I didn’t take another. If my gp has asked me about cramp he would have known, or my sleeping, or pain – instead I was given a tablet that if I had continued would have caused me possible immense damage. My faith in the NHS is down the pan – thank you so much for this article – I am off to my local Health Shop for magnesium hot quick – I will let you know how I get on. I have suffered Crohns Disease for 55 years, 3 resection of the Ileum, and for the last 5 years, I am now struggling to breathe, and become chronically breathless all the time. I HAVE just started taking Magnesium And pray that it will help me soon. Bathing regularly in a bath to which you have added magnesium chloride (2 tablespoons of the flakes) or having a footbath with magnesium chloride in and soaking for at least 10 to 15 minutes is also a good way for the body to absorb magnesium rather than taking supplements. I’m suffering with horrible acid reflux for over a year now that it gives me anxiety. Has anyone tried magnesium for bad acid reflux and has it helped ?? please I’m desperate. I am taking a PPI when needed but find myself taking it everyday now just so I can eat. Could it be deficiency of magnesium? Unfortunately, I can’t say. There are too many things that can cause dizziness and migraines. It’s unlikely that the dizziness is caused by a magnesium deficiency, however. So I was having heart palpitations dizziness and pressure in my head and chest, neck pain random pain all over nausea anxiety and more. I was diagnosed with vitamin d deficiency and I started taking high doses. Nobody told me that vitamin d will deplete your magnesium which I also think I am deficient in for sure now if I wasn’t before. I am getting a RBC magnesium test tomorrow as he serum test doesn’t show we are deficient as only 1% of magnesium is in the serum. Rest is in the cells. I just hope the 400 mg of magnesium glycinate I have will be enough to get me feeling better. I do occasional Epsom salt soaks. I don’t feel better but I read there are system in our bodies that want the magnesium and use it all up. I just want my life back as I was sick for 7 months now. And finally figuring out what it is. I’m 35 and feel 105. I was wondering, how would the body know that dark chocolate is what it needs when you have low magnesium levels? Anyway that’s just a thought. It is true that magnesium is overlooked by most people, that’s why this article is so helpful. Now I am starting to recall who among my loved ones has any of the symptoms above. I’m not sure how it biochemically works, but the systems for cravings based on nutrient deficiencies are there.